I've recently changed jobs, which I love, but the new hours are throwing me off. Mr. T and I like to eat earlier than later, so getting home at 6:30 and whipping something up is not the easiest task. To alleviate this problem, I've recently started researching crock pot recipes. I've got a crock pot on my registry, but this impatient girl just couldn't wait to start cooking. SO, for the time being I'm using this baby. Isn't she a beaut! This actually isn't my exact one, just an identical version of mine, sans the big chip in the top right corner. But no worries, mine still has the harvest gold tone and is adorned with the oh-so-seventies motif of fondue pots and sea food creatures. It was a gift to my mom from a boyfriend before she met my dad. Mom and Dad are going on their 33rd year of marriage this summer, so this thing is very seasoned to say the least. The recipe I'm trying tonight is incredibly simple. I seem to always be drawn to recipes with the fewest amount of ingredients. THAT'S IT! Let's hope that it turns out a little more flavorful than that bland name. If it's a keeper we'll definitely be renaming the recipe. I'll keep you posted! 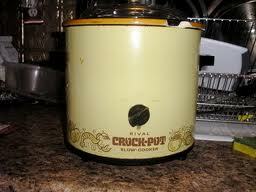 I've had a crock pot for a year now but I'm too scared to use it! Let me know how this goes! I was scared at first, too. Especially since mine is older than I am. Turn your crock pot on low and feel the inside of it. It stays at such a low temperature that it's safety is not a concern to me. Try it once and I promise you'll love it! And Katie, I will definitely be trying your BBQ Pulled Chicken soon! YUM! Yay!! Another Greenville blogger!! I've been hunting and not finding a ton... can't wait to read more of your stuff! Found you off of your Velo Fellow review.